Free one-day student seminar with presentations from leading policy experts, Q&A, and informal discussions. Lunch is included. Tech entrepreneurship is the heart of innovation, but it is everywhere beset by regulations. Uber created ride-sharing; 23&Me democratized access to genetic knowledge; WeWork revolutionized work space leasing—but all have received pushback from governments. Ms. Palagashvili will address how direct and indirect regulations have affected the young startups of the next generation of disruptive technologies, and what the impact of regulation is on innovation in different industries. In the early 1990s Canada faced a genuine public finance crisis, with big debt loads and large deficits at the federal and provincial levels threatening the economic health of the country. Fortunately, a wave of policy reform in the mid-1990s successfully addressed these challenges, eliminated the deficits, and restored the health of Canada’s public finances. Mr. Clemens will discuss this period in our history, including the challenges we faced, how we overcame them, and lessons applicable to the problems we are facing today. The scale and scope of connected devices that make up the "internet of things" present a unique cybersecurity challenge, as one's device's vulnerability can be a problem for the entire network. With incidents of ransomware, data breaches, and distributed denial-of-service attacks on the rise, cyberspace is now an active warzone. What role can policymakers and other stakeholders play in addressing the consequences of device insecurity in the internet of things? Senegalese entrepreneur Magatte Wade explains how the only way to create prosperity in Africa is through entrepreneurship and free markets. She describes the heavy regulatory obstacles to launching and managing a business across Africa and shows step-by-step how entrepreneurs change lives by generating jobs by creating value for customers. Should we buy and sell human organs? Prof. James Stacey Taylor argues that we should - and that concerns about the exploitation of the poor are misplaced. Professor Liya Palagashvili presents to students in Montreal about finding favourable climates for entrepreneurs. Students line up to ask questions following a presentation in Vancouver. After a morning of thought-provoking presentations, students take a lunch break before jumping back in that afternoon. A student poses a question to the speaker following a presentation in Toronto. Students break out into a smaller discussion group following a presentation in Calgary. Charles Lammam, Director of Fiscal Studies at the Fraser Institute, introduces speaker Fred McMahon, who presented on Economic Freedom at a Vancouver seminar. Speaker, Fred McMahon, takes a question from a student following his presentation in Vancouver. A group of students pose with Adam Smith, a prominent philosopher who laid the foundations of classical free market economic thinking, as part of the #SMITHSELFIE campaign. Students listen as Dr. Kenneth Green presents on Energy Poverty at a Saskatoon seminar. Check out #FIPolicyChat on Twitter to see what other students have said about these seminars. Following a presentation, students break out into a smaller group to discuss the topic further amongst themselves in Saskatoon. 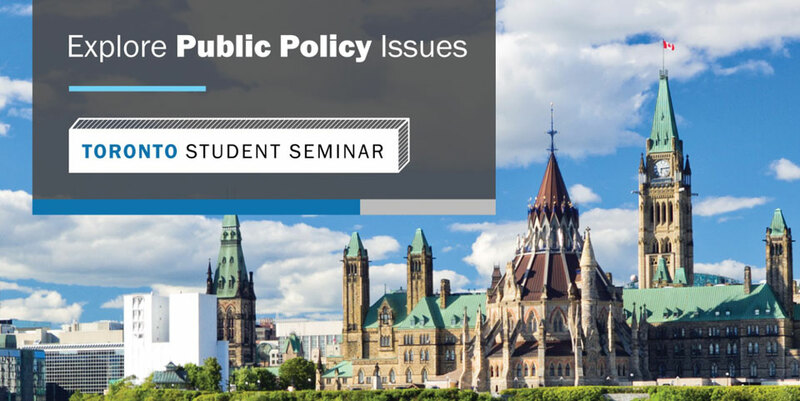 Seminars like this one are a more approachable format to learning more about topics in public policy that otherwise may seem daunting, especially for a student. A thought-provoking experience that will challenge your assumptions and broaden your perspectives. Amazing way to spend my Saturday. Very relevant and academic conversations inspiring students to professionally pursue these topics.